Why has my veterinarian recommended at-home subcutaneous fluid treatment? Administering supplemental fluids can benefit cats with a variety of medical conditions. Most commonly, home fluid therapy is recommended for cats with kidney disease or chronic renal failure (CRF). If your cat is diagnosed with a condition that will benefit from fluid therapy, your veterinarian can teach you to perform this simple procedure. Don't be alarmed - it is normal to feel hesitant or apprehensive about administering any treatment to your pet. "The benefits that your cat receives will make it well worth your time to learn this simple technique." Giving injections is outside the comfort zone for almost anyone outside the medical profession. However, subcutaneous fluid administration is not nearly as difficult as it sounds. The benefits that your cat receives will make it well worth your time to learn this simple technique. The equipment for home fluid therapy typically consists of a bag of fluids, a fluid drip set, and a needle. The fluid drip set is simply a tube that connects the fluid bag to the needle. 1. Remove the fluid bag and fluid drip set from their protective packaging. 2. Close the line lock in the middle of the fluid tubing by moving the roller so that it squeezes the tubing. The lock on a new fluid set is usually set in the open position. 3. The top end of the fluid set has a large, pointed end with a protective cap. Remove this cap, but do not allow it to become contaminated. IT SHOULD NOT TOUCH ANYTHING. 4. Pull the protective covering from the exit port on the bottom end of the fluid bag. This will expose a hole that will accept the pointed end of the fluid set. 5. Push the pointed end of the fluid set into the open hole of the fluid bag. It must be seated firmly to prevent leaks. 6. Gently squeeze and release the bulb at the top of the drip set until the bulb chamber is about half full with fluid. 7. Remove the protective cap from the lower end of the fluid set, but do not discard it. Do not allow it to become contaminated. IT SHOULD NOT TOUCH ANYTHING. 8. Open the line lock or roller on the tubing and then hold or suspend the fluid bag; fluid should flow freely. Fill the fluid line with fluid from the bag. Be sure that all large air bubbles run out of the tubing. a. Once the fluid line is full, close the lock on the fluid line by rolling the roller downward. b. Replace the protective cap on the lower end of the fluid set. 9. Open the protective wrapping around the needle so that the open end (not the sharp end) is exposed. Do not contaminate the open end by allowing it to touch ANYTHING. 10. Remove the protective cap from the lower end of the fluid set, and place the open end of the needle on it. Press it on firmly. You may discard this protective cap. How do you insert the needle into the cat? 1. At the level of the shoulder blades, just to the right and to the left of midline. 2. At the level of the hipbones, just to the right and to the left of midline. How do you administer the fluids? Choose a comfortable location where you will treat your cat. This may be on a table, countertop, or on your lap. 1. Hang the fluid bag about 3 feet (1 meter) above the level of your cat's head. You may create a bag hanger using a coat hanger, over the door clothes hanger, etc. "Be sure that both of you are in a position that will be comfortable for about 10-15 minutes." 2. Bring your cat to your chosen location. Be sure that both of you are in a position that will be comfortable for about 10-15 minutes. The end of the fluid set should easily reach your cat without much tension. 3. Pick up a roll of loose skin in one of the above locations. 4. Lay the point of the needle at the base of the roll of skin with the needle horizontal and pointing toward the cat's head(assuming that the cat is lying on its chest). 5. Advance the needle slightly forward while pulling the roll of skin backward. This motion should be firm and steady, not shaky and timid, and will place the point of the needle just under the skin. 6. Release the roll of skin. The point of the needle should remain under the skin. 7. Grasp the fluid set lock in one hand. Begin the flow of fluids by rolling the roller upward. NOTE: Some cats are more cooperative if they are placed in a box not much larger than the cat. A cardboard cat carrier is often the correct size. Other cats prefer being held in a towel that covers their head during the procedure. Experiment with different locations and techniques until you find the most comfortable technique for you and your cat. Most cats will quickly become used to the procedure. Your cat may seem nervous the first few times, but most become comfortable by the fourth or fifth administration. How much fluid should I give my cat? Your veterinarian will tell how much to give your cat for your specific situation. "The average sized cat should receive 100-150 ml of fluids at one time." As a rule, the average sized cat should receive 100-150 ml of fluids at one time. If you are using two locations, you should give half of that amount in each location. 1. Stop the flow of fluids by pushing the roller in the fluid set lock downward firmly. If you do not close it well and the bag is left hanging, fluid will drip out. Some bags will have an additional slide closure on the fluid line. You can close this additional device after you have removed the needle from your pet's skin. 2. Remove the needle from the skin and replace its protective cap. Be very careful when you replace the needle into the cap. This is when the majority of injuries and "needle sticks" occur. Remove the used needle from the drip set. 3. PLACE A NEW, STERILE NEEDLE ON THE DRIP SET AS SOON AS YOU ARE THROUGH. This prevents bacteria that were picked up on the old needle from migrating up into the fluid bag. If you wish, you may return used needles to our hospital for proper disposal. 4. Store the equipment in a safe place until the next fluid administration. The fluids should be kept in a relatively cool location out of direct sunlight. Be sure to keep this and all medications out of the reach of children and pets. It is usually not necessary to "sterilize" the skin with alcohol before inserting the needle. In reality, wiping a little alcohol on the skin does not really sterilize it and the odor and feel of alcohol may aggravate your cat. Most cats tolerate fluid administration quite well. However, if the fluids are unusually cold or hot, they may be uncomfortable. Ideally, the fluids should be stored at about body temperature. However, as long as they are at room temperature most cats are fine. Do not refrigerate them. As the fluids are running, a lump will form under the skin. Do not be alarmed; this pocket of fluid will be absorbed over the next few hours. If absorption is slow, gravity may cause the fluids to migrate downward along the side of the body. 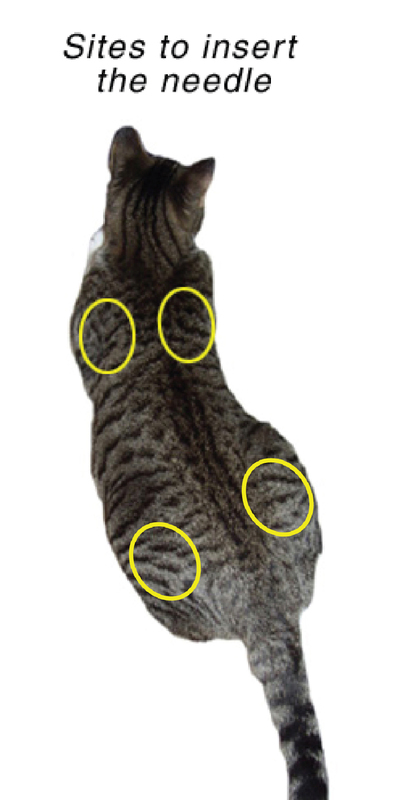 Fluids may even move under the skin of the front or rear legs in rare instances. Do not be alarmed. If this happens, the fluids will still be absorbed and your cat will not be in any pain or discomfort. You will not cause any problems if a few bubbles of air are injected under the skin. If quite a bit of air gets under the skin, you may feel a crackling sound when you push on the skin, and your cat may experience mild discomfort for a couple of hours, but no real harm or damage will occur. The body will eventually absorb the air without any difficulty. What should I do if the fluids stop running during administration? This often happens when the end of the needle moves against the skin or the underlying tissue. In this event, the needle opening is "blocked" or covered and fluid cannot flow freely. Do not remove the needle; rather, gently reposition it until the fluids begin to flow again. Experiment by slightly moving the needle's position (back and forth, up and down, side to side) until the fluids flow freely again. Twisting the needle (rotating clock- or counter-clockwise) will change the position of the bevel. "You may have to reposition the needle several times during fluid administration." In most cases, only a minor adjustment is all that is needed. You may have to reposition the needle several times during fluid administration. What should I do if the fluid runs slowly out of the bag? When you are finished giving fluids, you should close the lock firmly. However, closing the lock firmly may crush the tubing so that fluid will not flow well on subsequent use. If this happens, move the lock to another place on the fluid tubing, and open the crushed area of the tube by pinching it open with your fingers. What if the fluids become cloudy? "If any cloudiness or discoloration develops in the fluids, do not use the bag." If any cloudiness or discoloration develops in the fluids, do not use the bag. This discoloration or cloudiness usually means that the fluids have become contaminated with bacteria. If you administer these fluids to your dog, a serious infection may occur under the skin. 1. Give ______ ml of fluids at each treatment. 2. Treat your cat every ________ days or _____ times per week. 3. Return in _____days / weeks for recheck exam. ____Do not feed for _____ hours before this visit. ____Bring in a urine sample.